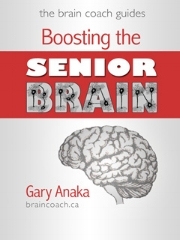 Boosting the Senior Brain, Gary's latest book, supports workshops such as Brain Wellness and Longevity and Brain Wellness for Caregivers. Boosting the Senior’s Brain is Gary’s message about the healthy lifestyle choices that can help Seniors avoid cognitive decline. A 30-year career in Special Education, which included several decades of special training in brain-based learning, have brought Gary to an immersive understanding of how neuroscience applies to this special stage of life. Gary outlines a range of brain-friendly tips for maximizing productive, independent living, all aimed at helping seniors stay mentally sharp! His writing is well organized, concise and thoughtful without overwhelming the reader. Boosting the Senior Brain can be downloaded for iPad at iBook Store. Print copies are available at blurb.ca, with volume discounts up to 20%! Your Brain on the Job supports the popular workshop by the same name. In this book Gary approaches work safety and productivity from the perspective of educating workers about their brains. Self-knowledge of brain readiness can mitigate injury and accident risks and activate more productive relational patterns in the workplace. This learning is universally applicable across all industries and professional settings. Your Brain on the Job can be downloaded on iBooks, and is eligible for Apple Volume Purchase Plan where available. Understanding the Teenage Brain is a follow-up to the popular workshop by the same name. Gary begins with an overview of brain structures and functions, then moves to safety tips and skills to practice with teens. Gary delivers his topics in plain language with a touch of humour. An easy-to-use glossary for key terms, and interactive images complete this very accessible read. Understanding the Teenage Brain can be downloaded on iBooks and is eligible for Apple's Volume Purchase Plan where available. Growing the Child’s Brain, from "The Brain Coach Guides" series, is a meaningful and practical resource book for anyone raising small children. 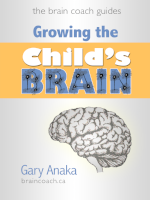 Author Gary Anaka is a professional resource teacher specializing in brain-based learning engagement strategies. “My experience is that parents, who are not familiar with brain compatible practices for raising brain-smart children simply do not know what to do.” This book is written in easy to read, everyday language. Discover powerful strategies such as why children must move, how to grow fantastic connections in the child’s brain, how to feed the brain, why free play is absolutely essential plus an overview of the problems of electronics and the media. Early childhood is the most all-important time for maximizing the child’s brain potential. Wise parenting can support critical life-long learning. Growing the Child’s Brain offers something for every parent who wants the best for his or her child. Growing the Child’s Brain can be downloaded on iBooks and is eligible for Apple's Volume Purchase Plan where available.